Flying High - After Some Drama! Arriving at the Wilfred Taylor Reserve with the Dowel Rokkaku kite in mid-afternoon, there appeared to be a very light breeze. Trees and leaves were hardly moving. No problem, thought I, the light-wind Rok was in the boot, and it would be easy to tow it up to contact slightly faster air if necessary. Sure enough, the first few flights were very short. They basically consisted of pulling the kite up to several meters in the air, followed by a slow float down as I attempted to get a bit more line out. Very light gusts sometimes allowed a short climb, so I took photos with winder under-foot to hold the kite. Eventually, enough line was out so that a good climb resulted. With over 30 meters (100 feet) out, I took some video from which I edited the clip at the bottom of this page. Thermals were everywhere, and with a bit of height, the big light Rok was punished by strong horizontal and vertical gusts. Yes, vertical! With the Dowel Rokkaku Kite almost straight overhead, the horizontal spars bent horribly as a thermal tried to pull me off my feet. At this time it was clear that the kite had a lean to the left. Hence I brought it down a couple of times to shift the bridle knots across a bit. The last time, I also moved the towing point forward a little to relieve some of the flight load on the kite. Since the kite had almost been forced down during gusts, I was pretty cautious about letting more line out. In lulls, I managed to walk upwind a bit without overpowering the kite. This took it further away from a few potential line-snagging trees. Soon, the yellow 60 meter (200 feet) marker came off the winder. Around this time I noticed the lower bow-line toggle had slipped out, from when the spar had slackened off the bow-lines. Told you the gusts were strong! This left the 2 lower bow-lines dangling beneath the kite. Oh well, the air pressure was obviously taking care of the required bow in the spar! The Dowel Rokkaku Kite still seemed perfectly stable. Looking up, it was clear that a rather fresh breeze was blowing higher up. The huge fluffy cumulus clouds were surging past, against a pale white backdrop of much higher cloud strata. This was not so much a wind gradient, as just a separate layer of fast-moving air. 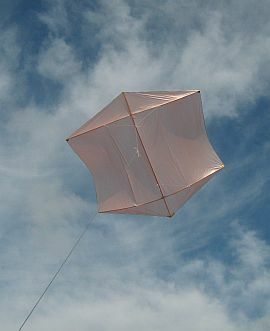 In the boundary between the slower layer and the faster layer, the kite seemed to show that the air was alternating between the 2 speeds. Spar-bending strain one minute, comfortably slow air the next. It was like the faster air layer was gusting down into the slower layer from time to time. The Rok was coping, so again I worked my way upwind a bit, almost back to the car parked near the western end of the reserve. By this stage, over 90 meters (300 feet) of line was out, exposing the blue tag. Strangely, the Dowel Rokkaku Kite was now flying very comfortably, easing around the sky at extremely high line angles. That is, between 60 and 80 degrees! Thermal lift was still apparent, but it was much more gentle now. Then I noticed that all the large cumulus clouds had departed way off to the south east. Aha! The strong wind was a local effect under the cloudy region, which had now moved on. Finally, another 30 meters of line went out, after which the Rok again climbed almost directly overhead. The kite was now flying very close to the legal ceiling of 400 feet. It was nearly time to leave, so I started a slow descent. Whenever I felt tension easing, I started to wind on line. 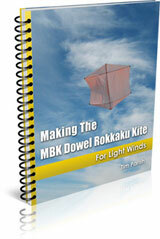 Gradually and reluctantly, the Dowel Rokkaku kite came down. At last, it was on a short leash and gently touched down tail-first just a meter or 2 from my feet. What a great flight, after getting through the earlier dramas!